Home Food Can Dogs Eat Blueberries? Would you like to find out can dogs eat blueberries? Did your pooch swipe some blueberries off your plate when you weren’t looking? Or maybe you’re considering giving your canine a few blueberries as a treat? 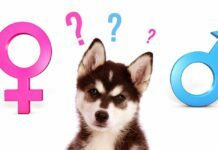 Sometimes figuring out what your canine can and can’t eat can be confusing. We all want all your beloved pets to be both happy and healthy. Which, of course, means they must EAT the correct foods. 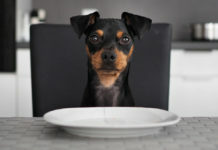 Often, dogs have a tendency to eat whatever they can get their mouths on—whether food out of their bowl, off the floor, or even from OUR plates. Therefore, it is our job as responsible dog owners to screen what our canines eat and to ensure it’s actually good for them. So, what about blueberries? Can dogs eat blueberries? Luckily, that’s exactly what we’re here to figure out! First, we’ll first look at what a canine’s diet should consist of, and then what exactly blueberries contain. 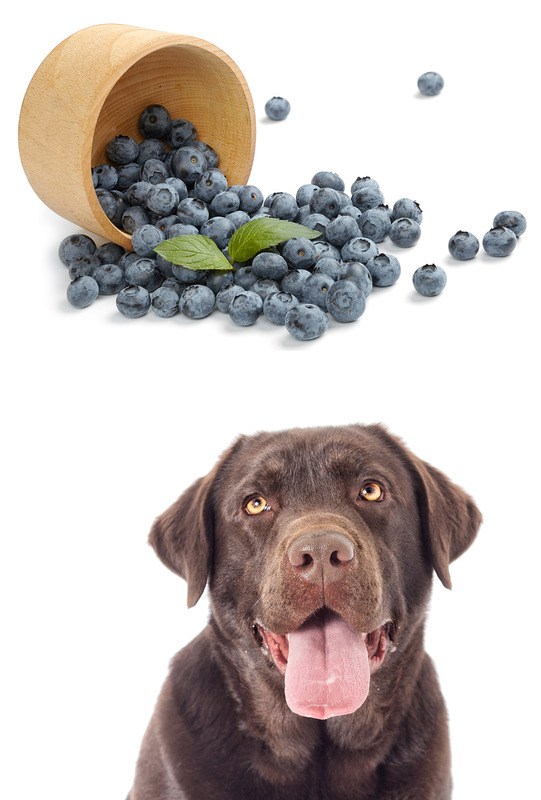 Finally, we’ll use this new knowledge to figure out if blueberries are a good choice for your pooch! Dogs, like all living beings, need a well-balanced diet to survive. Unlike some misconceptions, dogs are not actually carnivores. Although dogs are related to wolves, a study has shown that they have actually become adapted to eating a diet similar to a human. In other words, as dogs began to live close to people, they developed the ability to eat what humans eat—including grains and fruits. Therefore, dogs really do need to eat a balanced diet to live the best life possible. With that being said, dogs can technically operate on a meat or vegetarian diet, completely. But, just like people, special care must be taken to ensure your canine is receiving all the nutrients it needs. Just as human vegetarians must ensure that they eat plant-based protein, the same thing must be done with a dog’s diet. However, this does mean dogs can and should eat more than just meat. They are designed to eat and live off of a variety of foods—they really are true omnivores! Now that we’ve had a brief look at a dog’s diet, let’s turn our attention to what blueberries themselves contain. Then, we’ll know for sure—can dogs eat blueberries?. Blueberries are 91% carbs, 5% fats, and 4% protein. So, they are almost completely made out of carbohydrates, and therefore have a sugary nature, similar to most fruits and berries. But blueberries also contain a variety of important vitamins, in particular, vitamin K. In fact, they are one of the best sources of vitamin K you can eat! Blueberries are also high in antioxidants, which have a number of health benefits. In addition, they contain fiber, vitamins C, B6, and E, Thiamin, and Riboflavin. 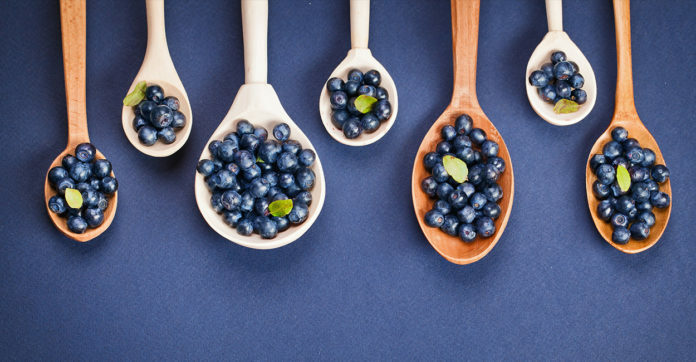 Antioxidants, one of the ingredients found in blueberries, can help prevent oxidation—a normal chemical process that occurs as things break down. Oxidation doesn’t necessarily have to occur with oxygen, as the name may imply, for example, rust is caused by oxidation as metal breaks down in the presence of water. However, this also occurs inside every living thing, including us and our pets. 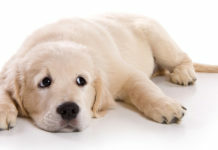 Whenever your dog exercises, breaths, breaks down food or does anything, oxidation occurs. And the breaking-down process produces uncharged molecules called free radicals. Free radicals can react with and injure other molecules inside the body, but only on a small scale of course. Accumulating these molecules over time, however, has been associated with aging, and can lead to diseases like arthritis, memory problems, and heart disease. Antioxidants are of great importance when it comes to controlling the damage done by free radicals inside your dog’s body. In fact, they are so important, they are often added to dog food. Supplementation is not always enough. And dogs often don’t eat enough fresh fruits and veggies, which are an abundant source of antioxidants. This doesn’t mean you need to start supplementing your canine’s antioxidant intake today. Too many antioxidants can cause issues since some free radicals are actually necessary for the body to function properly. Your pet’s immune system, for example, uses free radicals to attack viruses and bacteria. 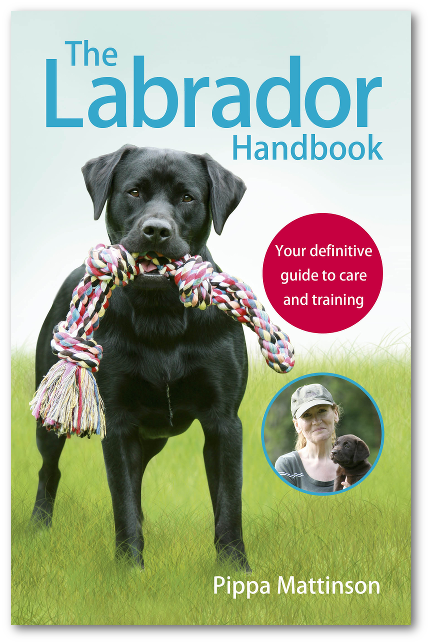 Therefore, it’s best to speak to your dog’s vet before starting your pooch on any type of supplement. Your vet can help you find the right dosage your pet needs to be most effective and point you towards a suitable supplement if your dog does need one. Fiber is another ingredient found in blueberries. Fiber is extremely important in a dog’s diet, though it is often overlooked. 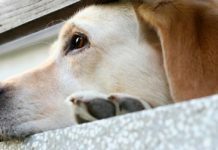 Without it, your pooch may be at risk of a whole host of issues. Fiber aids in digestion. Just like in humans, fiber is fantastic for a canine’s digestive track. It prevents bad bacteria from forming in the gut, helps the colon recover from injury, and even reduces diarrhea and constipation. Therefore, it really is necessary for your pup’s digestive health. Fiber can also go a long way in helping your pet maintain a healthy weight since fiber is extremely filling, and your dog will feel full while consuming fewer calories. This can go a long way in preventing your pooch from overeating and becoming an unhealthy weight. Because fiber is hard to digest, it can slow down digestion. This keeps blood-sugar levels from spiking, which can do wonders for pre-diabetic and diabetic dogs. In fact, many vets actually recommend a high-fiber diet to dogs with diabetes for this very reason. So clearly, fiber is very important in your dog’s diet and can provide a whole host of health benefits! So are blueberries the right source of fiber, antioxidants, and vitamins for your dog? And can dogs eat blueberries? Blueberries are not toxic to dogs and are actually full of nutrients and vitamins your dog needs to stay healthy! This makes blueberries an excellent choice as an occasional treat for your furry friend! Of course, a balanced diet is important too. So you shouldn’t feed your pooch ONLY blueberries. 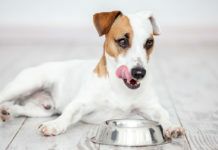 It’s best to feed your dog a wide range of other food, including a healthy dog food. 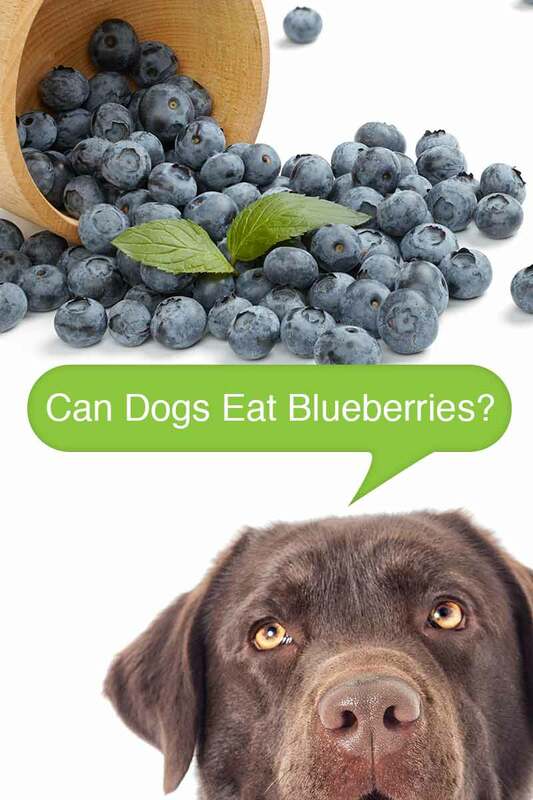 If you have any particular concerns about blueberries and your dog, it is always a great idea to ask your dog’s vet. They have plenty of expertise in this area and should be able to answer all your questions. Now that we know blueberries are actually great for dogs, here are some awesome recipes for you to try! These blueberry treats are superbly easy to make since they contain only four ingredients. They do contain both wheat and eggs, however. So if your dog has an allergy to either of those ingredients, it’s probably best to skip this recipe. This recipe is truly my favorite! Who doesn’t love blueberries and bananas? Just as the site says, they really are full of “fruity goodness”. This one is a little more complex, but based on my dogs’ reactions, they really are worth it! The recipe does contain some unusual ingredients like baby food, which you may not have in your pantry unless you have a baby! So be sure to plan ahead so you’ll have all of the ingredients you need. Does your dog like blueberries? Thinking about giving any of these recipes a try? Axelsson E. 2013. The genomic signature of dog domestication reveals adaptation to a starch-rich diet. Nature. 2012. Knight A and Leitsberger M. 2016. 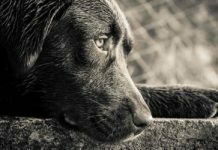 Vegetarian versus Meat-Based Diets for Companion Animals. Animals. Dowling A. 2013. Antioxidants in the Canine Model of Human Aging. Biochimica et Biophysica Acta. Johansen K. 2017. What Are Antioxidants, and Are They Good for Dogs Too? Huffington Post.